Bush Elementary School is located at 13800 WESTERLOCH DR, HOUSTON, TX, 77077-9999. The school is part of HOUSTON ISD. To contact the school, call (281) 368-2150. Bush Elementary School employs 43 teachers, who have been with the school an average of 10 years. The teachers average 12 years of experience in teaching. The school currently has 861 students with a student to teacher ratio of 20.00 S/T. The special education division has 3 teachers assisting it. Bush Elementary School also employs 11 education aids. 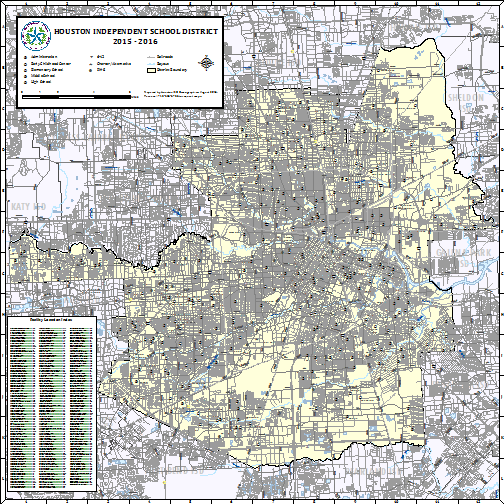 Elementary School Zones, 42" x 42"
Middle School Zones, 42" x 42"
High School Zones, 42" x 42"
TX SD Boundaries 24" x 24"
Office Area Map 42" x 42"
District Map, 42" x 42"
Board Districts, 42" x 42"